Cognisant of how much old brick work was disappearing due to new building and reclamation work chiefly in the main towns of Co. Roscommon I decided to give some thought to the production of home made brick in the county and further afield, in times gone by. 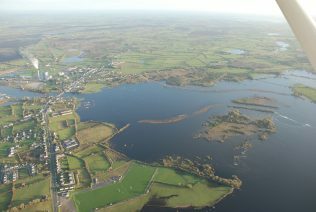 While some brickyards from south Roscommon such as Cloonown and across the Shannon at Gillen, Ferbane are well known. Lesser known brickyards are few and far between and sometimes, but for the folklore in the area, knowledge of when this trade was active in those places would be gone forever. Rivers and lakes from prehistoric times now covered by bog provide the essential muds favourable for brickmaking and the allied crafts of roof and floor tile making. The clay required for the related trade of tobacco pipe appears to be from more upland sources and scarcer in quantity. Bog pits after turf cutting were favourite places for brick clay and a good account of the production operations in all its aspects have been made by J.G. Delaney (1). Much information was available on this site because it was in use until the 1940s and he collected information in the 1960s from people involved in the work. Similar brickmakers were at work in Cloonown (2) and it is claimed that many buildings around south Roscommon, Athlone and Westmeath are constructed with the Gillen and Cloonown brick. How far the craft of brick making spread into Co. Roscommon is difficult to say. The Shannon and lakes close to it appear to have been a catalyst in the starting up of brickmaking as is evidenced from sources such as Isaac Weld, and as Delaney says, how the degree in which the Shannon, and the Grand Canal built in the later 18th cent., were conducive to increased production, or the cause of increased production, is difficult to quantify. The canal was useful for export of brick and turf to Dublin as barges could carry forty tons. Smaller enterprises were set up in various places around the county and some of these are known from newspaper and map references, others by folklore memory and still others by finds made during farming activities. 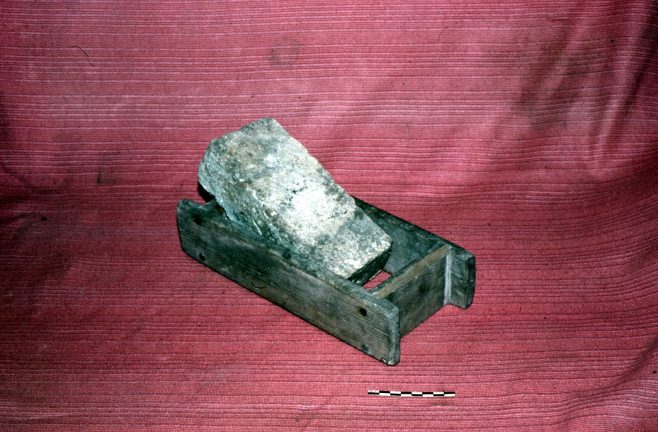 Roof tile fragments in large quantity found during ploughing by Mr E. J. Beattie of Ballagh, Rahara at lands in Bogganfin, Ballymurry, some years ago led him to the conclusion that they were defective in production and were cast aside as of little use. It is possible that they may have been made there and were cast-offs from the burning brick kiln. Muds suitable for brick making comes from effluvial or lacustrine deposits and afterwards covered with a substantial layer of peat. This may be the material used by an enterprise attached to a farm of 63 acres in Shanballymore, near Ballyleague, which had a brickyard and tillery. An advertisement appeared in the Ros. Messenger for Aug. 11th , 1860 to sell it, the vendor being Mrs Gillooly, Ashfield. The auctioneer was Simon Greene, Roscommon and the landlord was Marcus McCausland. Allowing for auctioneer’s flowery language the bricks made on it were “ for soundness and durability cannot be surpassed”. Memory of this business has all but faded in Shanballymore but there are memories of a similar enterprise near Moneen Cross not far away. This is probably one and the same as “Wakefield” (near Coolshaghtena td.) where one of the great builders of Workhouses of the 19th cent., George Wilkinson, examined bricks produced there in the 1840s and found them “not very good and of a grey colour”. His chart of measurement recorded them as 4½ lbs. in average weight, 8½ x3¾ x2½ inches in size and priced at 20 shillings per thousand . They were burnt in clamps with turf . In his survey he also examined bricks made in Boyle and Castlerea with similar observations (3). An upsurge in demand for brick came with the building of the larger country seats of gentlemen and minor gentry in the 18th cent. where brick was used to dryline the insides of same and erection of ice-houses nearby for preserving food for the occupants e.g. Beechwood Hs., near Kilteevan, Castlestrange Hs. in Fuerty, Mount Talbot Hs. near Athleague , King Hs. and Rockingham Hs. in Boyle to name just a few. On the land, brick was an important material to build the smoke funnels of lime-kilns e.g. at Clogher, the Chichester estate, Ballinaheglish. Import of terracotta roof tiles can be seen at the carriage-house of Scregg Hs. near Knockcroghery where the maker’s name Colthurst and Symons, Bridgewater with an image of Napoleon III is stamped on the tiles. Bridgewater is a location in Somerset where their Crossways Works in tile and brick production were winning international medals by the 1860s. Brick and tile were shipped to Dublin, and one boat, from recent research by Laura Hilton, was known as the ‘Sunshine’ (4) . Bricks were mentioned as commodities liable for murage duty in 1283, though their precise function and if imported is not clear. One of the towers in Bunratty Castle, completed round 1467, is vaulted with brick and the Norman Castle of Carrickfergus has brick features in the windows (5). The first substantial building of brick in Ireland was at Jigginstown, near Naas, built by Thomas Wentworth, Earl of Strafford, in the 1630s. Though now in ruins it is an imposing edifice and was one of the largest buildings in Ireland in its time. It went into disuse sometime after its erection. Coming to our own county the Castle of Canbo near Croghan, reputedly built by the Crofton family around 1600, exhibits an interesting twin stringcourse of brick in its walls, unusual for a castle of its period (6) . A mortgage document of 1756 mentioning brick now preserved in London gives the landlord as “coheirs of Lord Ranelagh” and lessees as Charles Fallon and J. McDermott holding 152 acres of land for 21 years. This was subject to a right of way for a “passage or convenient way for digging brickearth, marked on map with the letter M, next adjoining a park called Polnanaugh now in the holding of the Widow Roper”. Other tenants named in this mortgage were John Fannon, Michael Fannon, Dominick Dowd, Thady Kilhuly, Patrick Moran, and Denis Lihany (7). It would be interesting to know if any of the occasional brick found around Roscommon town came from this location which was in the vicinity of Gallowstown and Clooneybeirne. Another mortgage document from 1799 marks Brickpark in the same area on a map made by Bryan Hanley, Surveyor. The lands were leased by Viscount Malden and the Lord and Lady Fitzgerald to Robert Guff, one of a merchant family in Roscommon who later changed their name to Goff. The combination (meitheal) of tenants as in the 1756 mortgage of C.Fallon and J. McDermott with others to the benefit of the coheirs of Lord Ranelagh would be useful if brickearth was to be dug because it was tough, tiring work and plenty of help was essential. Delaney in his article on Gillen says that the work was so hard that it was hard to get men to participate in the exercise (8). We have already adverted to the investigations of George Wilkinson in testing brick from different brickworks in the county for the workhouses being erected in the 1840s. It is said that he was a man that required quality in all the materials used and is one of the reasons that his buildings have stood the test of time. About ten years before this Isaac Weld visited Roscommon to commence his statistical survey and found several brickworks in operation and that “fine clay is found near the banks of the Shannon in several places”, and they were selling for about 15 shillings per thousand (9). Weld was also interested in fireclay deposits in Arigna for making bricks for lining furnaces. A mining surveyor, Mr Twigg from Chesterfield thought the clay “was not very good” but a workman talking to Weld thought it “first rate quality and comparable to the fireclay mined at Stourbridge in England” (10). “Gala Tillery, Knockcroghery, Clonbrock Tile Works, Gala Harbour, all kinds of tiles 1½ inches- 4inches diameter, 7s/6d-15s/- (range of prices), Bricks, Tiles for Roof and Floor” ( 12 ). The word Gala is probably either a misspelling or an attempt to give a phonetic rendering of the way Galey was pronounced by some at the time. It could also very well be a fancy commercial invention based on the Galey name to bring a lighter touch to the enterprise. The inclusion of the name Clonbrock is interesting because it was nearly twenty years later in 1866, that Gerald, Lord Clonbrock married Lady Augusta Caroline Crofton of Mote Park. As the Crofton family were landlords at Galey it appears that there may have been an earlier kind of business arrangement with the Dillons of Clonbrock, who lived near Ahascragh, in producing the bricks and tiles at Galey. A brick boathouse, presumbably made from the local bricks, survived almost intact into the 1960s at Galey. It had the Crofton cipher and date (said to be 1850) in a moulded tile set in the gable of the boathouse as a decorative feature. In Carricknaughton, between Drum and Clonown brickmaking was still active until 1924 and in 1967 John Halligan who lived in the area made two bricks in the way he remembered it being done, for the National Museum. In 1966 he donated a wooden mould for making bricks to The old Athlone Museum. This mould was from Carricknaughton with the initials W.G. understood to mean William Galvin, probably a brick worker from the Clonown area. The late N.W.English of the Old Athlone Society was instrumental in this event and had a life long interest in building techniques and materials. The Arigna Mining Co. had a steady trade in purchase of culm coal for lime and brick burning and placed an advertisement in a local newspaper in 1901 (17). Most of the old brickworks must have been retired by the 1920s as we see the encroachment of the better quality industrially produced brick making inroads in the trade by that time. An advertisement for Youghal Bricks in the Roscommon Directory Magazine for 1921 may mark the demise of the older concerns (18) .Some of the mid 19th century machine pressed yellow brick can be seen around the windows at the Mercy Convent, Roscommon c.1860 and the old Gas House on Circular Road c.1861 (now demol.) was built of the same material. The Roscommon Post Office c.1912 was built of red brick probably of Bridgend, Glamorgan, manufacture. The old Jail in the Square built before 1790 had brick sewer passages outside the walls ( inside were wooden sewer pipe systems)which could have been sourced locally. While the above are a small number of incidences of brick in buildings local to the county town, there are traces of local brick in many of the other villages and towns of Co. Roscommon, often seen only when rebuilding or demolition has occurred. Massive import of bricks and tiles came into Dublin in Victorian times. Much of the red brick housing in that city was imported material from England and yellow brick from Kilmarnock in Scotland. The Exchequer Hotel in Wicklow St was built of Bridgend bricks some of them of ornamental type. Part of the reason for the demise of the local brickmaking enterprises was the difficulty of a homogenous product capable of withstanding the elements especially frost action which would break them asunder. Homemade bricks usually had to be rendered with mortar finish to prevent ingress of water and detrimental frost action . 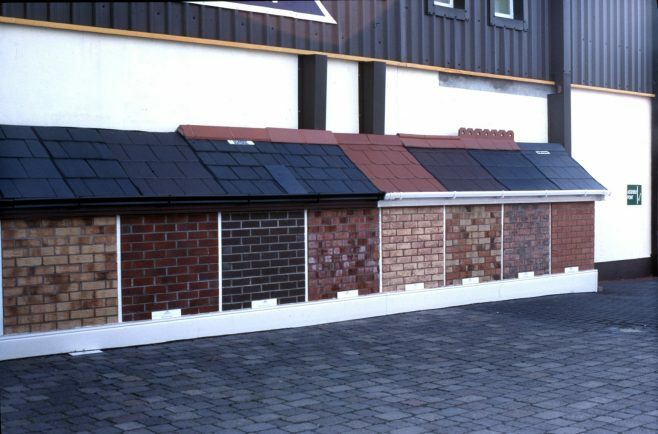 Superior kiln-dried imported brick was difficult to resist when it came in quantity and quality at an economic price. Concrete roof tiles were made in The Walk area, Roscommon town during the 1930s. The enterprise , begun by the Devine family, lasted for a brief period. There are some indications that the roof tiles on local authority housing on Circular Road came from this source. While there may have been numerous sites associated with brick and tile making in Ireland over the centuries it will suffice to indicate some locations where production information has been collected and recorded such as Cloonboo, Annaghdown, Co.Galway where examples of handmade bricks, the wooden brickmoulds in which they were formed and some of the yellow clay known as daub were collected by Ciaran Bairead in 1957 and he wrote notebooks on the manufacturing method employed by people who could still remember the process. The finished bricks were brought by boat down Lough Corrib to Galway City. Keekill, near Headford in the same county was another homemade brickmaking area (19). Co.Cavan was another notable brickmaking centre and they are still made there today. Carley’s Bridge, Enniscorthy, Co. Wexford has a pottery still surviving to the present. It was established in 1654 by two Kerley brothers. 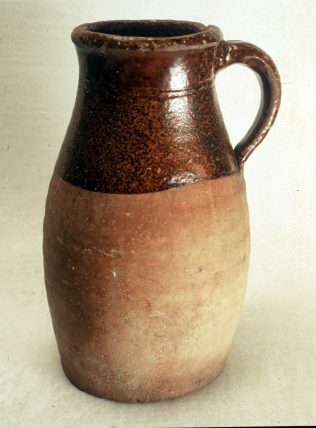 For generations too the principal clayworkers there were members of the Brickley family, immigrant potters and brickmakers, of which a direct descendant, Paddy Murphy, has established his own pottery and works in the traditional manner (23). Gerard Boate, travelling in Ireland in 1652 observed similar processes in brickmaking as obtained nearly three centuries later in many parts of Ireland. Having mentioned that brick was little used even among the English in Ireland but that of late, especially in Dublin, brick buildings had begun to be common. He describes in detail the method used. A square pit is dug into brick clay, clay broken up, water poured in, the whole mass worked with feet and spades until it is like dough. The late Arthur Moore of Taghmaconnell, believed that Gershon Boate, who led the Quaker community to Ballymurry in 1717, was a grandson of the above Gerard Boate. Since Gerard was interested in brickmaking it is possible that the Quaker community may have been initiators of the trade in the area (25). Bricks are made from clays composed mainly of silica and alumina, with small amounts of lime, iron, manganese and other substances. The different types of clays produce a wide variety of colours and textures. The composition of the fire gases can effect the colour as well. Most clay bricks are kiln–burnt, either in a Hoffman kiln in which the fire passes through a series of chambers whilst others are used for heating and cooling, or a tunnel kiln where the bricks pass through a long chamber with the firing zone in the centre. Clamp burnt bricks faded from the scene in Ireland in the 1940s. Handmade bricks are slightly irregular in shape and size with uneven edges; they are used solely for facing work and weather to attractive shades. The majority of clay bricks are either machine-pressed or wirecut. With machine pressed bricks the clay is fed into a steel mould and shaped under heavy pressure, whereas with wirecut bricks, the clay is extruded from a pugmill in a continuous band and then cut into bricks by wires attached to a frame . Coming to the 1950s the open air clamp burning of bricks was disappearing both in Britain and Ireland and most bricks were being machine pressed and fired by leading makers in modern type tunnel kilns. According to Delaney in his experience researching the Gillen brickfields it took , in modern terms, 50 lorryloads i.e. about 300 tons of turf to fire a kiln , about 30,000 or even up to 80,000 bricks. This enterprise took a great deal of fuel but the turf was cheap to produce generally with co-operative work, an important factor in making the business economic. It took at least six days to fire the bricks and for most of this time the lighter brown turf was used and heat directed from the north side and for the last day or so the heavier black turf was employed. In coal producing areas like Arigna we know that culm could be purchased and used as a filler between bricks to raise the temperature but not too hot or the bricks could spoil. Making the kiln was an art of engineering and building principles taking a fortnight to complete. It took a t least three people with pony and carts to keep the builder of the kiln supplied with bricks which were pitched up to him two at a time. Small pillars of bricks were made first and then extended into arches about three feet high. The top of these arches were levelled off with a ‘table’ of bricks. On top of this table ‘hacks’ of bricks were built about five feet high. The arches ran from one side of the kiln to the other and there could be from eight to twelve arches. There were up to 10,000 bricks in each arch. These arches acted as a firm foundation of individual furnaces that, when worked properly, acted in unison to make a successful firing for the kiln. Some vents were left on the top to allow the smoke to escape. When finished the kiln covered an area of 25 yards square and was about 10 feet high. Two men were in charge and had to be there day and night to watch the fires . The arches always ran in a north-south direction and the kiln was always fired first from the north side away from the prevailing wind. Before the fires were lit the whole south side had to be plastered with the same clay as from which the bricks were made, and the arches on that side blocked with bricks. Towards the end of the firing period the kiln men would know the stage the bricks were at by the colour of the flame. After four and a half days the north side was plastered and closed up. The latter side was then fired for another day and a half with black turf. This completed the burning of the kiln of bricks from which it would take many days to cool before it could be opened. Mine : the place from which the year’s supply of clay was dug, four yards wide and a hundred yards long. Munna : the ridge left between the old mine and the new to keep water out of the latter. This is an Irish word and owes more to the task of turfcutting than brickmaking. Forker : he took the clay up by the digger and threw it back into the pit with a four-tined fork. Sourer : he soured or tempered the clay by throwing water on it, tramping on it in his bare feet, and mixing it with his shovel. Shearer : a further process of tempering the clay was done by the shearer, who chopped up the clay, tempered by the sourer, with his shovel, before passing it on tothe banker. Banker : he threw up the clay passed on by the shearer on to banker’s table, which was placed on the bank of the mine. Banker’s table : usually an old door on which the clay was thrown from the mine for the barrow-man or wheeler. Wheeler : he left out at intervals five heaps of clay, each heap containing enough to make 5,000 bricks, for the roller and moulder. Roller : he took up enough clay from the heap beside the moulder’s table to make one brick, rolled it and kneaded it on the moulder’s table, in the turfmould or dust and passed it to the moulder. Moulder : usually the owner of the brickfield, took the roll of clay from the roller, slapped it into the wooden mould, rubbed it on the mouldwalk and ‘shaved’ it with his open hand on top. Parer and Hacker : bricks had to be pared or cleaned of clay and dirt and was done with a knife on all six sides of the brick. A few days after cleaning the bricks were made into ‘hacks’ i.e. building one on top of the other about five bricks high to assist the drying process. Mouldwalk : a plate of cast iron, with a flange on each side to keep it free from dust on the table. The brick was moulded on this iron plate. Offbearer : usually a young boy, who took the brick in its mould from the mould walk and trotted off with it to the spreading ground. There were always two offbearers kept constantly on the trot. Duster :1.always a woman, had to level and clean the spreading ground; 2. riddle turfmould cleared from the spreading ground for the moulder’s table for the use of the roller, who used it on which to knead the clay; 3. keep the tub beside the moulder’s table supplied with water. Coal-rake : wooden instrument used by the duster to level and clean the spreading ground (27). The complement of people required to turnout a reasonable amount of bricks for a morning’s work would require most of the above skilled workers and, indeed, was very often a family affair where the youngest to the oldest could take part in some way. There is no reason to believe that any brickyard in Co. Roscommon of any size would run in any great variance to the above . Whilst the above narrative is an indication of a forgotten industry in Co.Roscommon, there can be no doubt that the work was arduous in all its aspects and from once easier and cost effective methods of building like cement products became available the days of the homemade brickmaking industry were numbered. In 1970 Jim Delaney made efforts to cine film a simulation of the brickmaking in Gillen. His plan was to use Roadstone concrete bricks in an attempt to show how the kilns with the furnace arches were built. Various considerations contrived to hinder this event but he was certain “that it would be a great thing if we could get it done because it is hardly likely to occur again, as O’Criomthain says, ‘mar na beidh arleitheidi aris ann’ ” (28). We cannot doubt him in that.